Let’s be honest, we all have a special place in our heart for Patrick Swayze’s Road House. The cheesy fight scenes, Sam Elliot as a drunken badass or just seeing Swayze rip a guy’s throat out has helped it gain such a cult status that even Family Guy has a running gag about it involving Peter Griffin round housing various items. Now, according to a new report we are getting a remake with perhaps the pound for pound baddest woman on the planet. mmafighting.com is reporting that current UFC women’s bantamweight champion Ronda Rousey has been tapped to star in a remake of Road House. MGM still owns the right to the original and has selected Rousey for the starring role. In the original 1989 film, P. Swayz starred as a bouncer hired to protect a bar, and by proxy a small Missouri town, from a corrupt businessman. The new version will feature Rousey as the female lead with a new spin on the original film. Before accepting the role, Rousey reached out to Patrick Swayze’s widow, Lisa Nieme, to get approval for the part and received it. A screenplay still needs to be completed, and filming will have to revolve around Rousey’s fight schedule. Ronda currently has a fight scheduled for 11/14 vs. top bantamweight Holly Holm but should be getting some time off shortly thereafter. 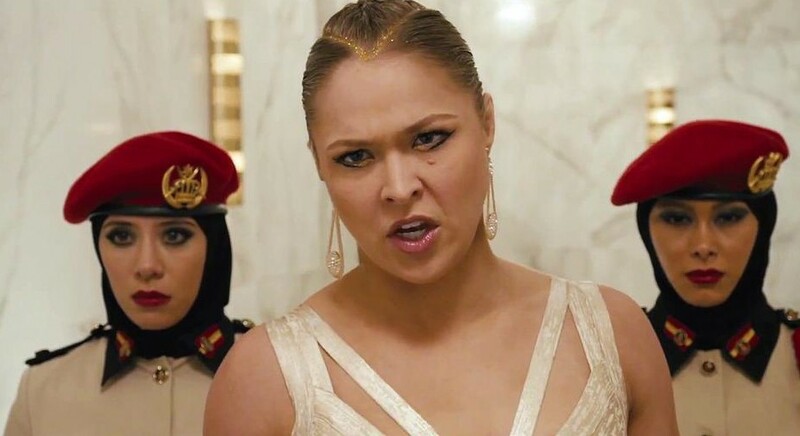 Rousey has had smaller roles in The Expendables 3, Fast 7 & the Entourage. None of those roles required her to carry an entire film, so it should be interesting to see how Rousey’s acting chops will hold up but if it’s anything like her last few fights, she should be just fine. Sound off and let us know if you think MGM made the right choice in “Rowdy” Ronda. This entry was posted in Breaking News, Film and tagged mgm, Road House, Ronda Rousey. Bookmark the permalink.